the urgency of now . . ."
It's now more than 32 years since China launched its program of "Reform and Opening", and in three days it will have been 22 years since the death of Hu Yaobang, which lead eventually to the Tiananmen uprising. Both of these events stand as sign posts in recent Chinese history although at the time the true significance of these events would have been very unclear. One of them marked the beginning of economic liberalisation. The other the suspension of real hope for political liberalisation, and the transformation of China into its present form. At the risk of making a hostage to fortune, I'm going to hazard a guess at saying that this year marks another such inflection point in Chinese affairs. The events this year so far in China auger the final abandonment of political change, and the beginning of the end of the Chinese Communist Party (CCP) in its present part-dynamo, part-dinosaur form. Why do I say this? In the career of every prize fighter there comes a point when the crowd, which a moment ago was roaring approval, draws a little breath as a jab sails through thin air and misses it mark, and a doubt is planted in the mind of all those watching that can only grow as time does its work. The CCP as it stands today has, I believe, reached this point with its latest crackdown. Whilst they were simply imprisoning nobodies, quixotic individuals who even China politics geeks like myself could hardly remember the names of, none of these arrests rocked the boat, even if they did involve Nobel laureates. The arrest of Ai Weiwei, though, is a different matter. In contrast to Liu Xiaobo, Ai Weiwei is well known, both as an artist and as an eccentric. The economic crimes excuse that is being pushed right now will not convince many - even if it were true, the questions would then be asked: Why Ai? Why now? A line of thought which leads to some familiar questions: Who? Whom? The Chinese Communist Party (CCP), which for years has walked a tight-rope between along the line between inflicting so much repression on people that they rebel and so little that they become unafraid of the party, now shows signs of over-balancing itself. People who it had managed to silence, like Zhao Lianhai, have now redoubled their criticism, perhaps seeing that they have little to lose in doing so since they stand to be next in line after Ai. This crackdown risks exposing the CCP leadership as never having genuinely supported reform, at least not in the past ten years. Without the carrot of reform, the CCP has only the crude stick of oppression and the bitter offerings of nationalism with which to coral the populace. This will convince some, but not all. It is easy to see where the impetus for this crack-down is coming from. We may be more than a year away from the beginning of Xi Jinping's reign, but it is hard not to see the same crude artlessness in these arrests that Xi has betrayed in many of his public pronouncements. I hope I'm wrong, but I cannot rid myself of the idea that Xi's rule is going to be disastrous for both the CCP and China. It is hard not to think that we are seeing the end of the balancing act that the CCP has so successfully conducted these past 32 years, and the beginning of an unashamed totalitarianism which few in the CCP ranks want, even if their new leader apparently does. The relatively subtle touch introduced by Deng in 1979 risks being undone, if not the economic reforms of that year and later. I agree to a large extent, especially if Xi's rule just brings more of what's already in use now. However, what "hardline rants" except that in Mexico is actually on file? That's the one I keep seeing over and over, and to me it doesn't necessarily say so much about his ideas. To me it seems like something you say to please your boss. i am curious to know your opinion of the Chongqing mayor/party leader.. the one that has been sponsoring these throwback celebrations to the little red book days? please, your insight is much appreciated. on a side note, there seems to be an enormous number of rich chinese mainlanders (re: party members/business class) that are buying up 'parachute' properties in Canada - is this a harbinger? thought you might like to know. Your thoughts remind me of this nagging discussion of leadership I find myself in with friends living in southern Africa. The cultivation of leadership and its implementation are puzzling. How is it that China seemed to, er, fare better than others in the last 30 years? Its totalitarianism, for all its warts, never quite snapped that fragile limb it rested on. Whereas in many African countries leaders not only snapped the branch off but went on to burn the whole damn tree down. Were Hu, Jiang, Yang, etc, somehow more "talented" in some sense than the likes of, say, a Bob Mugabe? What are the determining factors, both internally and externally? And in regards to your prediction, is Xi the leader under whom it will all finally fall down? No easy answers. @Wukailong - That was my interpretation of his speech at the time. Since then, I have read also his criticism of Zhang Yimou, his praise of WW2 movies, his speeches attacking time-wasting speeches which then proceeded to waste time. Of course this is little to go on, but the man has not given me the impression of being sage-like in his wisdom or judgement. Rather, I have a similar feeling to that which I had about George W. Bush before he became US president, except that I was much more willing to make excuses for him in those days. Xi seemingly has the same artlessness and heavy-handed unseriousness as Bush, who was never as stupid as some of the pundits made out, and who had some things going for him when he was lifted to the presidency, had back in 2000. I therefore think he may well have been expressing his true opinions in Mexico. @Lao Wai - Nationalism in China is leaning against an open door. Whilst the populace has no great love of extremism, it is practically impossible to be too nationalistic in China. Bo Xilai, mayor of Chongqing, probably knows this, and has been exploiting it to the hilt. His problem may well be that he has made himself to much of a target by trying to build up his own power base in Chongqing rather than playing the patronage game as Xi did. 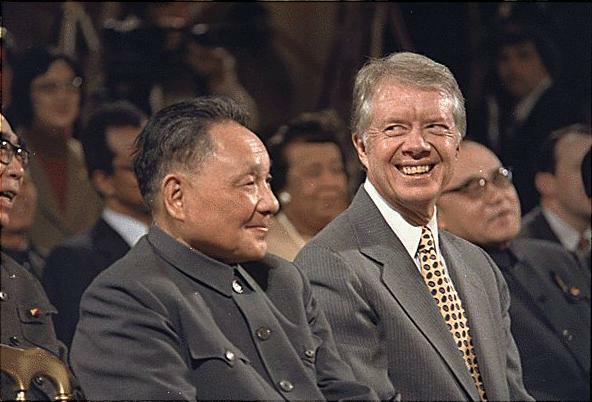 Bo is a Chinese Yeltsin - a populist, nationalistic mayor, but I doubt he will ever get the opportunity that the 1991 coup gave to Yeltsin by removing Gorbachev from the scene. As for rich Chinese buying properties abroad, this is more likely to be in the way of a status symbol, or a way of achieving coveted residency status, than as insurance. The rich are not likely to have anything to fear from a Xi/Li government. @Miles - Sorry about getting spammed. "Oh, I am but a humble official, I don't make much"
"Oh come off it, we all have a bit of a fiddle every now and then, what was your take from each of these projects"
"Next year you must come to my country and I will show you how to do these thing properly"
Okay, so a bit long-winded, but you get the drift. The difference between China's rulers and those in other parts of the third world has been self-imposed restraint. This is not motivated by high moral purpose, but by the simple assessment that, in the long term, this is in their interest. My fear is that recent events may presage a partial abandonment of this restraint. Good take on Bo Zilai. The rest of the Politburo either secretly hate his guts or are green with envy. As I said on CMP, Bo Zilai is a modern warlord in an Armani suit who is presently excelling in burearcratic manouvre. Either way, he had better tread carefully on the national stage. Too much charisma generates collegial suspicions. "I suspect Bo Xilai is trying to break the mould in terms of provincial government leadership with a mix of go go business friendly policies, some proposed populist measures as low cost housing , serious population surveillance management and not forgetting his own his own mafia alliances." I found nothing particularly striking about that speech in Mexico when I read it two years ago, except that a man with a pretty full belly was speaking to another lot of people with - presumably - full bellies there. Re Xi Jinping's location within the collective leadership, Jiang Zemin (not a frugal type of leader, and not too caring of the socialist countryside, they say) is his big daddy. Jiang likes opera houses better than farms. German chancellor Merkel had the privilege of studying Jiang's collected works with him in Berlin, in October 2009. Unfortunately, those hilarious pictures (then available online via Xinmin Evening Post) have since been taken offline. So Bo is one of Jiang's clique, eh? I hadn't known this, it's certainly be interesting to read up on the relationship between the two. It'd also help explain the way in which Bo's career has hit a bit of a brick wall. If Bo Xilai is one of Jiang's grandsons, too, I don't know. Xi Jinping certainly is. Jiang's inclination for singing aria at international banquets made him more funny (or terrifying, who knows) company than what Xi Jinping will probably be. According to WikiLeaks, Bo Xilai's chances at the top slot were diminished by party elders' hatred of his father and because he was at the helm in Liaoning during the worst of the Falun Gong persecution and the Party feared having China's leader served legal papers during every visit to a non-authoritarian country. Li Peng was dogged by this for 1989. @KT - Interesting piece, though of course much of this is in the way of rumours. @Slim - Given the record of the past 25 years, and Xi's possibly beligerent tone, Xi is likely to re-create such circumstances soon enough. Ooops, I misread JT's comments above, Bo has no connect with Jiang. But JT - you say that Xi is a Jiang-ite? Yes. Xi Jinping is from Jiang's school, and keeps piously belonging there. "Xi and Jiang are close - 习、江关系密切" was the message Xi sent with his public Jiang appearances in October 2009, believed Singapore's zaobao.com. Jiang also stole some of the limelight from the PRC's 60th anniversary (and therefore from Hu Jintao who - according to other reports - would have favored Li Keqiang over Xi Jinping). Another thought... all the choreography, plus Chinese and Western experts interpretations do suggest that Xi will succeed Hu Jintao as party and state chairman (and the CMC, of course). But this is only going to be the "5th generation", and only the first or second time that Deng Xiaoping hadn't influenced the succession line (they say that Hu was still his post-Jiang choice). The CCP will probably be happy to have found a post-Hu Jintao arrangement, and will stick to it if possible, but this isn't 2012 yet, and both mistakes made by Xi, and other surprises, can still shake it up again. Xi zhuxi is still an assumption, even if a very likely one. Friends like these . . .